Statistics show one in three adults in the United States has a criminal record, because of this fact access to education, jobs, housing and other necessary things to achieve a productive life are limited. Tag in Prison Fellowship, the nation’s largest nonprofit serving current and former prisoners and their families. 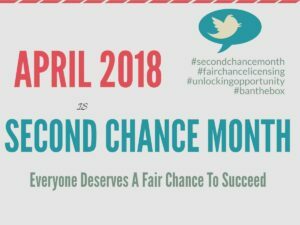 In an effort to raise awareness of the collateral consequences of a criminal conviction as well as unlock second-chance opportunities to those who have paid their debt to society and want to become contributing citizens; the Prison Fellowship declared April as Second Chance Month. Beginning in 2017 Prison Fellowship, who are also advocates of justice reform have spearheaded the nationwide effort to breakdown the barriers of people with a criminal record. Since then the movement has received widespread recognition. More than 77 organizations joined the effort as official second-chance partners (our founders for-profit among them). The White House just issued a proclamation on March 29. The United States Department of Justice recognizes National Reentry Week, as do a lot of providers on the relink.org website. Follow our facebook page as we highlight them and their events this month.